The poverty of Sri Lanka which was 26.1% in 1990 could be reduced to 6.7% in 2011 with various social security programmes implemented in the past. 2017 has been declared as the year of elimination of poverty in Sri Lanka and further steps should be taken to achieve this goal. Under the 'Shrama Shakthi' programmes 700 Grama Niladhari Divisions are selected which records a poverty of 10% to 45% in 2017 and a Peoples' Company Council will be established with a General Council and a Board of Directors with the participation of 80% of families in above divisions. Representatives of these companies will be trained and deployed in poverty alleviation and development funds will be issued to these companies. Rs. One million will be issued to each village at the end of 2017. In addition to these 700 villages, another 300 villages with a capacity for development of production will be selected and they will be provided with necessary technology and financial facilities to create new employment opportunities. Accordingly, the proposal made by H.E. 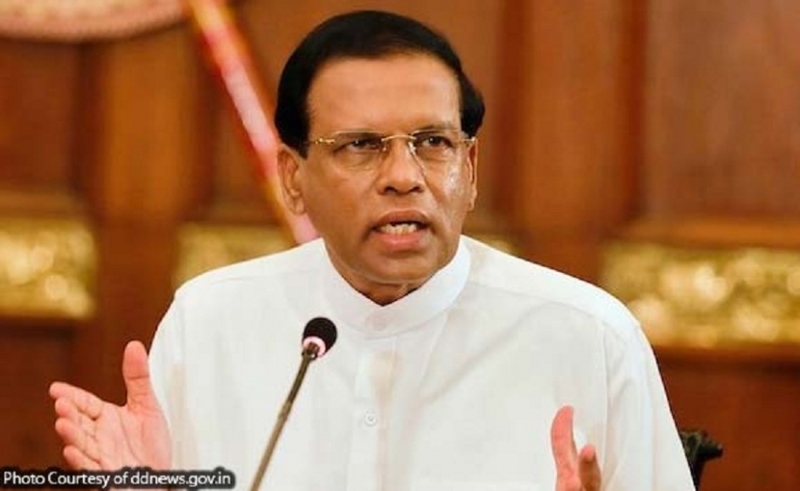 the President Maithripala Sirisena, to implement the above programme with public, private and people's participation, was approved by the Cabinet of Ministers. There is an increased demand for above construction material with present development activities and it has been stressed the importance of introducing a proper method for supply them with minimum environmental impact. Accordingly, the proposal made by H.E. the President Maithripala Sirisena, in his capacity as the Minister of Mahaweli Development and Environment, to introduce a proper method to excavate for such material in lands under the Sri Lanka Mahaweli Authority and Department of Wildlife Conservation which are under the purview of the Ministry of Mahaweli Development and Environment, and to supply them after a proper environment impact assessment, was approved by the Cabinet of Ministers. It is essential to improve the capacity of domestic pharmaceutical manufacturer to cater the pharmaceutical demand and provide quality medicines in low prices. About 15% of demand is manufactured in Sri Lanka and government expects to increase it to 80%. Accordingly, the proposal made by Hon. Prime Minister Ranil Wickremesinghe, in his capacity as the Minister of National Policies and Economic Affairs, to provide tax reliefs to raw materials, packaging materials, equipments, tools and accessories, and to accelerate the establishment of the proposed Biomedical Zone to attract investors, was approved by the Cabinet of Ministers. The government expects to introduce a new act instead of Securities and Exchange Commission Act No. 36 of 1987 and the presented concept paper has been amended with the laws, experiences of Malaysia, Singapore, and Hong Kong. Accordingly, the proposal made by Hon. Prime Minister Ranil Wickremesinghe, in his capacity as the Minister of National Policies and Economic Affairs, to draft a new act as Securities Exchange Act to strengthen the independence of Securities and Exchange Commission and make attractive the capital market of Sri Lanka, was approved by the Cabinet of Ministers. The government of Netherland through reputed companies of their country has agreed to provide concessionary financial facilities to construction of rural bridges, construction of Polonnaruwa Vocational Training Centre, and implementation of Mirigama Water Supply project, and accordingly, the proposal made by Hon. Prime Minister Ranil Wickremesinghe, in his capacity as the Minister of National Policies and Economic Affairs, to take necessary steps to evaluate the proposals presented by such companies, was approved by the Cabinet of Ministers. The government plans to build 500,000 houses for low and medium income families in 2017 and budget 2017 has proposed to grant the ownership of Condominium and Non condominium properties of government to their residents who have been dwelling in those lands for more than 15 years. Accordingly, the proposal made by Hon. Prime Minister Ranil Wickremesinghe, in his capacity as the Minister of National Policies and Economic Affairs, to prepare a suitable mechanism in this regard, was approved by the Cabinet of Ministers. Sri Lanka with compared to other countries in the region is regressive in infrastructure development due to the dependence on public funds and it would be productive to try the PPP module which is successfully applied by other countries. Accordingly, the proposal made by Hon. Prime Minister Ranil Wickremesinghe, in his capacity as the Minister of National Policies and Economic Affairs, to appoint a Cabinet Appointed Negotiation Committee and a Project Committee to prepare a suitable mechanism to attract foreign investments through PPP, was approved by the Cabinet of Ministers. The proposal made by Hon. John Amaratunge, Minister of Tourism Development and Christian Religious Affairs, to sign the above MoU in line with the official visit of H.E. the President in Russia, was approved by the Cabinet of Ministers. The proposal made by Hon. Gamini Jayawickrama Perera, Minister of Sustainable Development and Wildlife, to sign the above MoU for exchange of technological knowledge, information for the scheduled developments in Dehiwala Zoo and its affiliated Pinnawala Elephant Orphanage, and Ridiyagama Safari Park to be implemented till the end of 2018, was approved by the Cabinet of Ministers. A land of seven acres (07) has already been allocated at Pitipana, Homagama on the above purpose and it should be established according to international standards. Accordingly, the proposal made by Hon. Susil Premajayantha, Minister of Science, Technology and Research, to appoint a Cabinet Appointed Negotiating Committee for obtaining necessary consultation services, and obtain technological and financial assistance from suitable agencies, in this regard, was approved by the Cabinet of Ministers. Patients with various situations arrive at government hospitals for treatment and it has become essential to keep their reports stored properly to be referred again. They should be stored with modern technology to be found easily when required. Accordingly, the proposal made by Hon. (Dr.) Rajitha Senarathne, Minister of Health Nutrition and Indigenous Medicine, to establish a setting up picture archival and communication system (PACS)/ radiology information system (RIS) for 20 government hospitals, was approved by the Cabinet of Ministers. Considering the importance of providing quality medical supplies in time, the proposal made by Hon. (Dr.) Rajitha Senarathne, Minister of Health Nutrition and Indigenous Medicine, to implement the two (02) projects, i.e. the project for developing store facilities in 134 hospitals and 26 Regional Medical Supplies Divisions at a cost of Rs. 712 million and the project for expanding Medical Supplies Management Information System to Regional Hospitals at a cost of Rs. 954 million, was approved by the Cabinet of Ministers. Above alliance has been established to counter non communicable diseases and it has agreed to a 05 year strategic plan to prevent and control NCDs. The proposal made by Hon. (Dr.) Rajitha Senarathne, Minister of Health Nutrition and Indigenous Medicine, to provide Rs. 5 million annually to the said alliance for 05 years from 2017 to implement the activities identified by the strategic plan from allocations given to the Ministry of Health Nutrition and Indigenous Medicine, was approved by the Cabinet of Ministers. The budget 2016 has proposed to introduce a new inland revenue act for create a better tax structure by modernizing tax administration based on noncomplex tax principles and improve efficiency of the department of inland revenue. Accordingly, the proposal made by Hon. Ravi Karunanayake, Minister of Finance, to instruct the Legal Draftsman to draft the new bill based on prepared concept paper, was approved by the Cabinet of Ministers. The proposal made by Hon. Ravi Karunanayake, Minister of Finance, to publish in gazette and present in parliament for approval, the bill drafted by Legal Draftsman to amend the Economic Service Charge Act No. 13 of 2006 and cleared by Attorney General, including the amendments proposed by 2016 and 2017 budgets, was approved by the Cabinet of Ministers. Although, the Immigration and Emigrations Act No. 20 of 1948 was amended in 1955, 1961, 1993, 1998,2006, and 2015 it should be amended to suit present complex global challenges such as illegal migrations, human trafficking, terrorism, transnational crimes etc. Accordingly, the proposal made by Hon. S.B. Navinna, Minister of Internal Affairs, Wayamba Development and Cultural Affairs, to instruct the Legal Draftsman to draft the new act, was approved by the Cabinet of Ministers. Ministry of Health, Central Environment Authority and Sisili Hanaro Encare (PVT) Ltd has planned to implement a clinical waste management project in Mulleriyawa Hospital. Accordingly, the proposal made by Hon. Patali Champika Ranawaka, Minister of Megapolis and Western Development, to provide a land of 2 acres 1 rood and 23.99 perches at Muthurajawela on 30 year lease basis to Sisili Hanaro Encare (PVT) Ltd, on the above purpose, was approved by the Cabinet of Ministers. The proposal made by Hon. Patali Champika Ranawaka, Minister of Megapolis and Western Development, to Establishment of a Project Management Unit to implement Light Rail Transit project from Colombo Fort to Maradana via Bambalapitiya and Borella and from Borella to Malabe, was approved by the Cabinet of Ministers. The proposal made by Hon. Navin Dissanayake, Minister of Plantation Industries, to implement a programme of promoting Ceylon tea by giving a free tea package for tourists of selected countries using Rs. 100 million from Sri Lanka Tea Board, was approved by the Cabinet of Ministers. Above programme was introduced for consumers who receive a monthly bill of Rs. 2000/- by budget 2017. However, 40% of consumers get a bill less than Rs. 300/-. Therefore, to make this programme it was proposed to grant the relief to all consumers and for loans obtained from any state or private bank and to increase the limit of the loan from Rs. 150,000/- to 350,000/-. The above proposal made by Hon. Ranjith Siyambalapitiya, Minister of Power and Renewable Energy, was approved by the Cabinet of Ministers. SLSEC owns a land of 14.5 acres at Pelityabgoda with a potential of using in a largescale development activity especially on residential and commercial purposes. Accordingly, the proposal made by Hon. Sajith Premadasa, Minister of Housing and Construction, to appoint a Cabinet Appointed Negotiating Committee and a project committee on necessary further activities, was approved by the Cabinet of Ministers. The proposal made by Hon. M.H.A. Haleem, Minister of Post, Postal Services and Muslim Religious Affairs, to construct a separate place with letter boxes in existing and newly constructing housing complexes for each household and to provide the relevant keys to owners of houses, to prevent difficulties faced by postmen in delivering post in housing complexes and to instruct relevant ministries to direct Urban Development Authority, Housing Development Authority and relevant Local Government Institutions to act in accordance with this decision, was approved by the Cabinet of Ministers. Above amendment is to be done to address difficulties faced by public due to stray dogs. Accordingly, the proposal made by Hon. Faizer Mustafa, Minister of Provincial Councils and Local Government, to instruct the Legal Draftsman to amend the above ordinance to make provisions to increase the fine on owners of stray dogs to Rs. 25000 and the imprisonment to 02 years, was approved by the Cabinet of Ministers. Cabinet has approved obtaining a loan of GBP Sterling 100 for construction of 537 bridges from Deutsche Bank AG London on 21 February 2014 and its project period ends on 08 December 2017. As to changes of exchange rates there is a surplus of funds and accordingly, the proposal made by Hon. Faizer Mustafa, Minister of Provincial Councils and Local Government, to use those funds in building 63 additional bridges and to extend the project duration from another 03 months from 08 December 2017, was approved by the Cabinet of Ministers. The proposal made by Hon. Dayasiri Jayasekara, Minister of Sports, to present in parliament for approval, the Gazette notification (Extraordinary) No. 1990/23 dated 27-10-2016 and the gazette notification (amended) No. 13/2006 dated 13-02-2017 issued by repealing the Sports Regulations made by the Minister of Sports under section 41 of the same act (to read with section 31 of the Sports Act No. 25 of 1973), was approved by the Cabinet of Ministers. The proposal made by Hon. Sagala Ratnayake, Minister of Law and Order and Southern Development, to amend above acts according to proposals made by legislation subcommittee of the National Dangerous Drugs Control Board, with the contribution of relevant stakeholders, to amend the punishments and laws to save the future generation from the drug menace, was approved by the Cabinet of Ministers. A centralized Household Transfer Management Project is to be implemented with the view of establishing a National Digital Identifier and National Digital Transaction platform. In this regard a National Policy on Collection, Storage, sharing and use of citizen's personal data should be compiled to affirm the protection of those data. Accordingly, the proposal made by Hon. Harin Fernando, Minister of Telecommunication and Digital Infrastructure, to instruct the Legal Draftsman to amend the above act for implementation of above tasks, was approved by the Cabinet of Ministers. Human Capital Solutions (PVT) LTD is established to provide human resources to Sri Lanka Telecom and other external institutes. Their staffs are consisted of 2650 employees and 2180 of them are attached to SLT. They are paid by HCS and 1331 permanent employees are receiving a monthly salary between Rs. 30000 to Rs. 100000 with other benefits. Some of these employees demand to absorb them to SLT and if they are absorbed SLT would have to spend an additional cost of Rs. 1.6 billion. However, considering the proposal made by Hon. Harin Fernando, Minister of Telecommunication and Digital Infrastructure, the Cabinet of Ministers have decided to instruct the Board of Directors of SLT to absorb qualified and experienced employees of HCS to SLT on humanitarian grounds under 04 stages from 2017 to 2020. The proposal made by H.E. the President Maithripala Sirisena, in his capacity as the Minister of Mahaweli Development and Environment, to award the above contract as recommended by the Standing Cabinet Appointed Procurement Committee, to the lowest responsive bidder, the Nawaloka Constructions (PVT) Ltd at a cost of Rs. 625.73 million (without VAT), was approved by the Cabinet of Ministers. The proposal made by Hon. Rauff Hakeem, Minister of City Planning and Water Supply, to award the above contract as recommended by the Standing Cabinet Appointed Procurement Committee, to the lowest responsive bidder, the M/s Sanken Construction (PVT) Ltd – Vonlan Constructions (PVT) Ltd at a cost of Rs. 678.06 million, was approved by the Cabinet of Ministers. Proposals were called from 03 companies to implement above project but only Mascinen – Umwelttechink – Transport Anlagen (M-U-T) has presented proposals. Accordingly, the proposal made by Hon. Rauff Hakeem, Minister of City Planning and Water Supply, to award the contract to the said company at a cost of Rs. 46.21 million Euros, was approved by the Cabinet of Ministers. There are about 3500 thalassaemia patients and 500000 vectors in the country. It is identified that establishment of the above unit is necessary as many of Thalassaemia patients are in Kurunegala, Colombo, Gampaha, Anuradhapura, Badulla, Ampara and Kandy Districts. Accordingly, the proposal made by Hon. (Dr.) Rajitha Senarathne, Minister of Health Nutrition and Indigenous Medicine, to award the above contract to Central Engineering Consultancy Bureau, and Central Engineering Services Private Limited at a cost of Rs. 856.9 million, was approved by the Cabinet of Ministers. Cabinet has approved several projects in the country to develop indigenous medicine in the country in 2013 and 2016 but the projects have been delayed due to various reasons. Accordingly, the proposal made by Hon. (Dr.) Rajitha Senarathne, Minister of Health Nutrition and Indigenous Medicine, to accelerate these projects and to obtain the consultancy services for the projects from Central Engineering Consultancy Bureau and to award construction activities to State Engineering Corporation, was approved by the Cabinet of Ministers. The proposal made by Hon. Sagala Ratnayake, Minister of Law and Order and Southern Development, to implement the above project as the first step of developing the academy to international standards, at an estimated cost of Rs. 674.26 million within midterm budgetary framework 2017-2019, was approved by the Cabinet of Ministers. This act aims to encourage the payment of income taxes and similar programmes implemented in various countries have increased their tax earnings. Accordingly, the proposal made by Hon. Prime Minister Ranil Wickremesinghe, to instruct the Legal Draftsman to draft the above bill based on the drafted concept paper, was approved by the Cabinet of Ministers. The proposal made by Hon. Prime Minister and Minister of National Policies and Economic Affairs, Ranil Wickremesinghe, to publish in the gazette and present in parliament for approval, the Foreign Exchange Bill drafted by Legal Draftsman and cleared by the Attorney General, repeal the existing foreign exchange laws that do not comply with present day needs, was approved by the Cabinet of Ministers. The above agreement which is to be signed between Sri Lanka and China Merchant Port Holdings Company in China aims at preparing future plans, financial provision, operational promotion and development of infrastructure including completed phase I and II and proposed phase III. The Cabinet of Ministers have decided to enter into the above agreement which is cleared by the Attorney General and to appoint a Cabinet Subcommittee chaired by Minister of Special Assignments (Dr.) Sarath Amunugama to supervise its implementation. About 3,225 students annually leave schools after sitting for OL and AL examinations in Polonnaruwa District but capacity of government training centres is insufficient. Accordingly, the joint proposal made by H.E. the President Maithripala Sirisena, and Hon. Mahinda Samarasinghe, Minister of Skills Development and Vocational Training, to establish a new vocational training centre in Hingurakgoda under loan assistance from the Government of Netherland, was approved by the Cabinet of Ministers. Above project expects to increase the higher education opportunities in science, technology, engineering and mathematics and to improve the quality in higher education sector during 2017-2022. The International Development Agency has agreed to grant a loan of USD 33 million and the International Bank for Reconstruction and Development has agreed to provide a loan of USD 67 million for the project. Accordingly, the proposal made by Hon. Prime Minister Ranil Wickremesinghe, in his capacity as the Minister of National Policies and Economic Affairs, to hold discussions and enter into loan agreements for obtaining these loans, was approved by the Cabinet of Ministers.